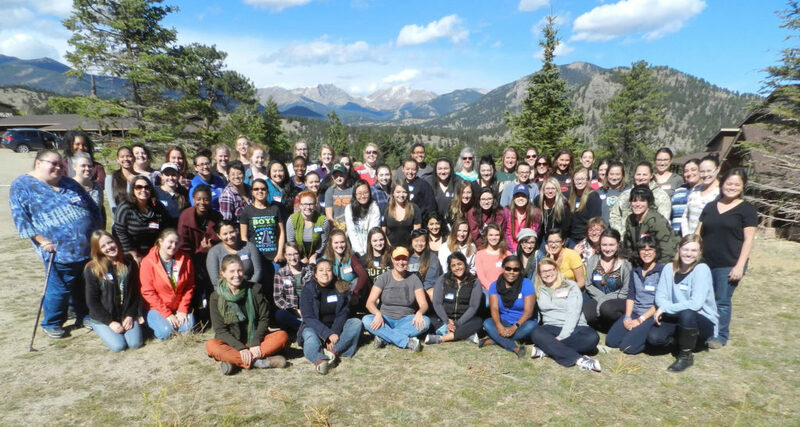 November 29, 2016 – In fall 2014, a professional development and mentoring network for undergraduate women studying geosciences, called PROGRESS, was launched at Colorado State University. Supported by a $1.7 million National Science Foundation award, Emily Fischer, assistant professor of atmospheric science, and co-investigators from CSU, Colorado College and West Virginia University, welcomed their first group of students in 2015. PROGRESS (Promoting Geoscience Research, Education and Success) has since rolled out both on the Colorado Front Range and in the Carolinas. In October, Fischer and collaborators welcomed their second cohort of about 90 undergraduate women. “We’re testing whether this type of program is sustainable in different regions, and whether this is a feasible model for undergraduate women,” Fischer said. PROGRESS is inspired in part by the Earth Science Women’s Network (ESWN), an international organization that provides career and community support for its 2,500 members in 50 countries. Its member base is primarily made up of graduate-level or higher women, however. Fischer started PROGRESS with Melissa Burt, Diversity Initiatives Manager for the College of Engineering. They wanted to create a program that would open up valuable professional development opportunities to undergraduate women in the geosciences. Along the Front Range, participating universities in PROGRESS are Colorado State University, University of Colorado Boulder, Metropolitan State University of Denver, Colorado College and University of Wyoming. Participating Carolinas universities are North Carolina Agricultural and Technical State University, University of North Carolina at Charlotte, North Carolina State University and University of South Carolina. PROGRESS begins with a weekend workshop that introduces participants to the environmental and earth sciences and shows them examples of diverse women working and succeeding in these fields. A focus of the program is mentoring, and students also learn about the value of mentoring and how to build networks. “Students really like the workshop, and for some, it’s this moment when they were kind of lost, or ready to change their major, but coming to the workshop provided a community and gave them the energy to realize that this is something they can do,” Fischer said. During the weekend workshop, students are also paired with more senior women who serve as long-term mentors. Student-mentor pairs are encouraged to meet several times each semester, as well as attend PROGRESS-hosted networking events on each participating campus. “Through mentoring, our goal is to provide students with support and positive affirmations, especially during their first semester,” Fischer said. Networking events are open to all PROGRESS participants and are meant to facilitate engaging, fulfilling, and overall meaningful relationships for students. Many of the women serving as PROGRESS mentors are also current members of ESWN. The women involved are inspired to give back to undergraduates because of the support they’ve experienced through ESWN. “We’re excited about creating this engaging, supportive, and comforting environment that we’ve been able to experience, but at a graduate level,” Fischer said. ESWN members have also experienced firsthand the challenges of working in the geosciences, and hope that early exposure to the sciences will help undergraduate students realize these fields are societally relevant. Though women continue to be largely underrepresented in the geosciences, the hope is that mentoring and community building can help close that gap. The effort follows a decade of successful diversity-related efforts in the Department of Atmospheric Science. Interested in becoming involved with PROGRESS, either as a mentor or a participant? Contact Emily Fischer at Emily.V.Fischer (at) colostate.edu. Additional resources for women interested in the earth and environmental sciences are available on the PROGRESS website.